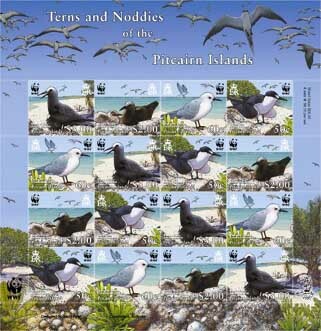 The Pitcairn Islands Philatelic Bureau is pleased to issue a WWF- supported issue on the Terns and Noddies of the Pitcairn Islands. Found mostly on Oeno, and Ducie and less frequently on Henderson and Pitcairn itself, the species are not endangered but worthy of WWF recognition. Black Noddy Anous minutes has dark plumage, a white cap, a straightish beak and shortish tail. The Black Noddy has a wide tropical distribution and occupies a marine environment where it remains close to its breeding colonies. Nests are often created in the branches of trees, using dried leaves and bird droppings. One egg is laid each season. Population totals have not been accurately determined but the species is not in decline. The species is rated on the International Union for Conservation of Nature and Natural Resources (IUCN) Red List as of least concern. The Brown Noddy Anous stolidus is the largest of the Noddies and is recognised by size and dark brown plumage. Like its cousin the Black Noddy it is colonial, lays one egg each season and first breeds between 3 and 6 years. Growing to 450mm, the Brown Noddy feeds by plunge diving to catch small fish near the surface, as well as flying fish and squid. Of interest is the etymology as “Anous” is Greek for unmindful and “stolidus” is Latin for impassive. The birds are often unwary and find safety in numbers. To sailors they were well known for their apparent indifference to predators. Growing from 280mm to 350mm, the Blue Grey Ternlet Procelsterna cerulea is found in the central to west Pacific between Hawaii and Fiji. Little is known of the species’ movements outside the breeding season. With pale blue-grey plumage the birds have a black bill and legs and the feet feature yellowish webbing. The black eyes have a ring around them. They feed on small fish, crustaceans and squid taken from the water’s surface, and nest along cliff faces in hollows, which hold rough seaweed and grass nests. Sooty Terns Sterna fuscata skim the ocean surface taking food on the wing. They rarely touch down as their oil glands do not protect the plumage from becoming waterlogged. Sooty Terns feed sometimes at night off small fish that are driven to the surface by predatory fish. They grow to 450mm and breed in colonies on rocky or coral islands. Breeding follows highly ritualised and vocal aerial displays and a single speckled egg is laid on the ground as no nest is prepared. Sooty Terns are distinguished by black upper parts, white underside and a distinctive stripe running from the eye to the bill. Sooty Terns are known to live up to 32 years. This issue has been produced in conjunction with the World Wide Fund For Nature. The Philatelic Bureau is grateful for the assistance received from WWF and for the use of the marks, which have been included with the authorisation of WWF, the registered trademark owner. 28 February 2007 for a period of 2 years. The Pitcairn Islands Philatelic Bureau acknowledges the support of Dr Michael Brooke (UK), Brian Chudleigh (NZ) and WWF in making this issue possible.